These flashlights are great for a personalized gift, incentive or promotional item. Just 2" long, this little flashlight is attached to a keychain to keep it close and handy. The 1 LED lights brighten your way in your choice of three colors, and personalized it makes a practical promotional item or personalized gift. 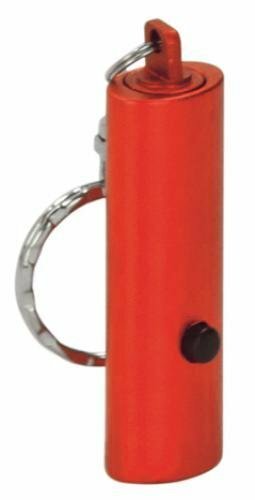 Just 2-3/4" long, this little flashlight is attached to a keychain to keep it close and handy. The 1 LED lights brighten the way in your choice of three colors, and personalized it makes a practical promotional item or personalized gift. Just 2-3/8" long, this little flashlight is attached to a keychain to keep it close and handy. The 3 LED lights brighten your way in your choice of three colors, and personalized it makes a practical promotional item or personalized gift. Stay safe with this 7 3/4" 7 LED flashlight to light your way. Its the perfect flashlight to keep in your car or your nightstand for emergency needs. Available in 3 colors, the flashlight uses 2 C batteries and can be personalized with your event or company logo for a practical incentive, promotional item or gift. Stay safe with this 3-1/2" 9 LED flashlight to light your way. Its the perfect size flashlight to keep in your car, purse or nightstand for emergency needs. Available in 3 colors, the flashlight uses 3 AAA batteries and can be personalized with your event or company logo for a practical incentive, promotional item or gift.